Well it’s the last week of July and it really does fee like summer with hot days, NW winds, and some coho off W. Van. This past week saw some good action from the Cap Mouth up to Point Atkinson but there was hot and cold days for sure. There are definitely some schools of biting fish and definitely some schools of non-biting fish, so it can be frustrating. We have had good success on white hootchies and anchovies and productive rigger depths have been 30-65. The numbers of fish along West Van will build in the coming weeks as more fish move in from the offshore waters of Strait of Georgia. Kenny + family on the water with Captain Eddie. Speaking of the offshore fishery, we are still having decent action off the Hump when we had the conditions to get out there, which hasn’t been as much as we would like. On the choppy days the fish have been shallow from about 15-55 on the riggers and on the calmer days or when the sun is higher a little deeper has been better from 25-75. White and UV white hootchies have been very productive with purple UV flashers like UV Purple Kinetic, Purple Onion, and Purple Haze working well when combined with the white hootchies. 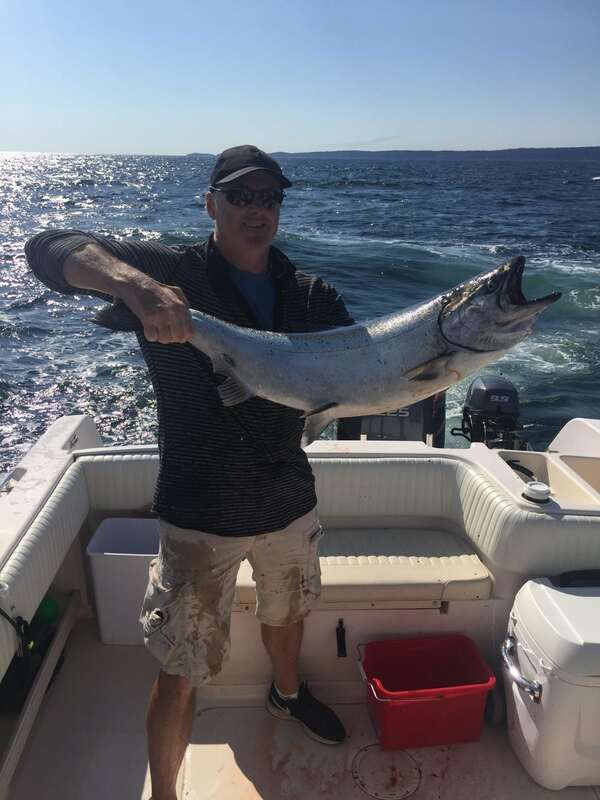 There has been some good fishing over at Gabriola and Nanaimo as well. I have been reporting on this for almost 2 months now, so if you are a regular reader you know the drill. Fish down deep, close to bottom with glow flashers and glow hootchies. The problem has been the wind, and the NW has done a good job of keeping us off these waters. When we have made the crossing it has been worth it with big chinook up to the mid 20’s. 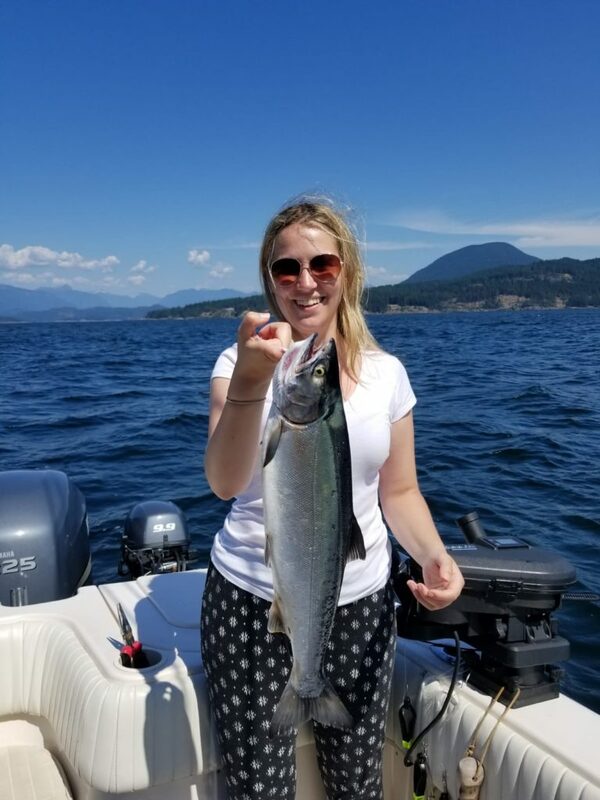 I am not sure how many times we will get over there in August as the Fraser chinook are on the way and so are the sockeye, so lets take a look at these two fisheries. 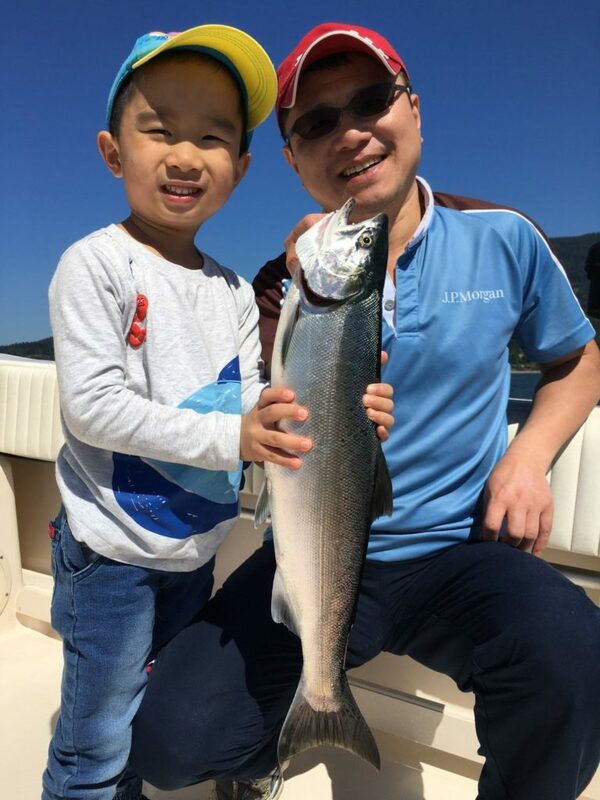 Captain Khoi’s guest with a solid chinook from his trip this week. 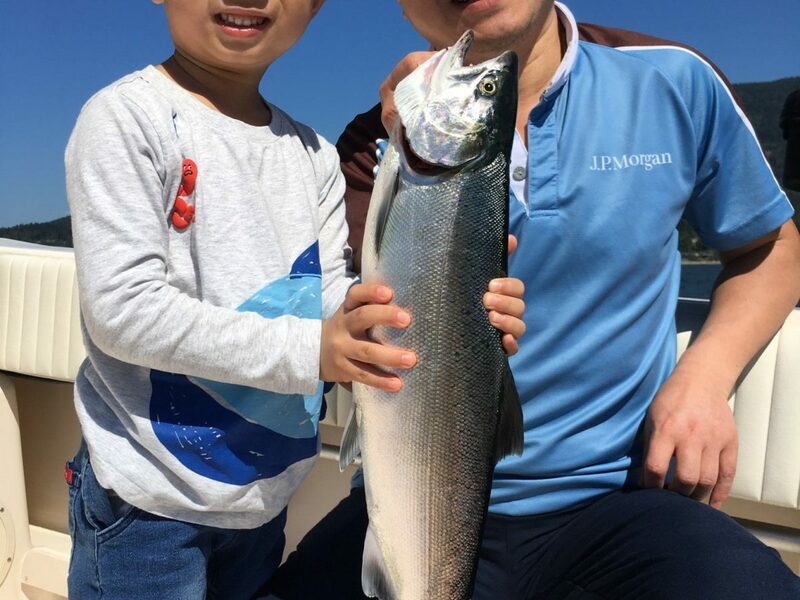 The Fraser chinook are around but it is typical late July fishing in that you hear of a guy who got 4, you go out and you get no bites. That is typical for this time of year as small pushes of fish show up and head up the river. If you are there on the lucky tide you get fish and if not you don’t. Fishing will get more consistent as we get into August, but for now you will have to put your time in to find these fish. We have run into a few random ones while fishing out on the Hump on our shallow rods, so they are around, but be prepared to put in some time. If I was looking for these fish in local waters I would concentrate around the Bell Buoy on the flood tide and my riggers would be in the 30-75 range with bait on all 4 rods. I will report more on this fishery in about a weeks time with some pictures of our preferred flashers and teaser heads but you can’t go wrong with a chartreuse glow flasher like a BC or Phantom paired with a chartreuse glow or green glow teaser head. The big question we keep getting asked is are we going to have a sockeye opening this year? The answer to that is looking like yes more and more each day as the data starts rolling in. The 50% probability estimate is 13.8 million fish and the data we are getting now is showing the early part of the run is tracking at about a 75% probability. That means if this trend continues we will get more than the 50% 13.8 million and we could be looking at something in the 15-20 million range. That would be nice but even if we get the 50% probability number that would be great as in recent years most runs have been coming back lower than the 50% number, usually around 35%. So although nothing is certain at this point, it is looking pretty good. When they will open it is hard to say. Some think as early as August 4th and I was thinking maybe the 18th but now I am thinking maybe the 11th. Keep in mind just because it is open doesn’t mean the fishing is immediately red hot. You need a lot of fish around to have consistent fishing and that usually happens mid August with some of the better fishing later in the month of August. I will report more as the data comes in over the next few weeks. I am taking a week off starting today to pursue one on my other passions, chasing steelhead on the Spey rod. So I will be up on the Dean swinging flies so good luck out there this week and Lars, our Booking Manager and one of our guides, will be writing next weeks report. I will send him any sockeye info I get to keep everyone in the loop.